As I mentioned in the previous post, I wasn't as active blogger this year that I was hoping to be. This is my 52nd post for the year, so it makes it one per week. Last year I blogged twice per week, so the drop is quite big. Still people kept visiting and reading my blog and the visitor amount raised steadily with the rate of about 100 more readers per month. Here's a list of my most read blog posts for the year 2012. There's one from 2011, but that was read mainly during this year. Book reviews played the big part on my blog attractiveness. That's normal due to the fact that most of the posts were about book reviews. Luckily there's two other blog posts in the top list to prove to myself that people are interested on other things as well. The blog post, cultural differences can make culture's diverge, was actually written long time ago already in August 2011. At that time, it got the normal interest of less than hundred reads. Just lately, it for some reason got attention again. Within latest couple of months people started to read and share it again. That's the reason it got to the list. These are posts that I think has a good point and are written quite ok, but they didn't get the attention I would have wanted. That happens quite often, the posts that I think are interesting are not read a lot and then vice versa. Here are the posts that I appreciate and want to raise from this year for another change. Why there is so much Business Jargon? Who would pay for the news paywall? Go check some of these out and leave comments if you think those are important or good ones. Where does my readers come from? I haven't opened this up ever before, but I think it's a time to do this also. In the very first year of this blog, my readers came naturally from Finland. Now that I have blogged regularly about three years, situation has changed. There's wide variety of people from many different countries visiting. I really appreciate that one. Thanks for everyone who has visited and read some of my posts this year. It's quite easy to see books have been the main blogging interest of the year. I'm bit surprised that people raises as such a high word in my writings. I 'm happy that that there are so many positive words which are used often: goog, interesting, easy and believe. This tells it even more clearly, I have been able to stay positive in my writings. I've tried to keep sports out of this blog, but at least swimming has sneaked in. Business and companies are there also. I would have thought that I've written more about experiences, but that's smaller that business for example. Design, which I do like a lot, is not even on the list. That needs to change for the next year. Want to create you own? If you want to create your own Wordle about your blogging, the most reliable way I have found to do it with blogger is this. First get all feed items for this year with this: [blogname]/feeds/posts/default?redirect=false&max-results=[here the amount of blog post this year]. Then select all text there and paste it to you text editor. Then you can remove something before pasting it to wordle. My previous years wordle's can be found from here: Wordle 2010 & Wordle 2011. This book had been a long time in my reading list. 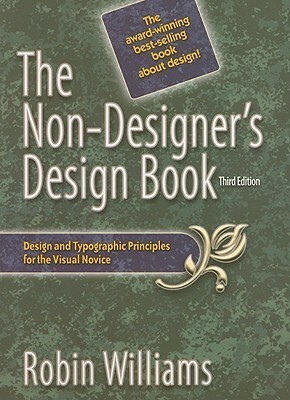 I've wanted to read The Non-Designer's Design Book by Robin P. Williams for few years already. I've read some design books before and customer experiences are also my favorite work subject. Design is such a big part of experiences, that I've wanted to learn much more about that subject for some time. I had read so many good reviews about the book, that expectations towards the book was high. When I received the book and started scim the book through I was bit amazed. I had imagined it to be somewhat different. I was bit disappointed at first. When I finally started to read the book, I totally loved it. It went back to the very basics of design. It goes through the basic concepts of Contrast, Repetition, Alignment and Proximity. Understanding and following these basic elements would make many documents and presentations so much better. The best thing is, that book explains all of these with ease and fun. The later section of the book concentrates on text and fonts. Understanding fonts was really a new thing to me. I do see text differently after reading this book. I've known that there are many different fonts out there, but I haven't really realized how those work together and what is the difference of all those. Now I've scratched the surface on typefaces and I definitely want to learn more. This book should be mandatory in all the schools, where presentations and documents need to be created. We would have so much more informative and pleasant reading experiences if everyone would have read at least the first part of the book. The fonts section was fun for me, but I can imagine it won't be for everyone. It was fun, easy and important book to read. I highly recommend this to everyone. 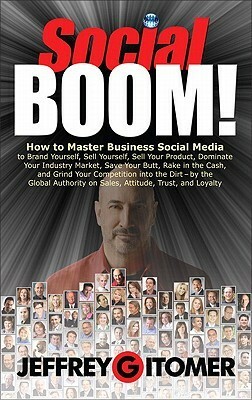 I recently read Jeffrey Gitomer's Social Boom! This wasn't a book that belong to my to read list, but I still read it because we had some LinkedIn related ideas flying around the office. I wanted to check if there would be some good tips about business social media for us. Contents of the book as such are quite good. It goes trough the most important social media's from business point of view and tells how one could create sales leads with social media. Book didn't offer much new for myself, but that might be due to me being quite familiar with Social Media's already. The style of the book was much too American for me. There was big bold letters and amazing words used all the way through the book. I think it was made for American sales man. For silent northern European it was awful to read. I felt like someone was shouting to me and slapping my face all the time. I do like that people don't care about what others have to say. Jeffrey Gitomer seems to be just this kind of a guy. He talks straight and teaches what he has learned. I do appreciate that. He just feels much too arrogant for my taste. I don't actually recommend this to anyone. It is not bad as such, but it is not fun to read. It felt bit like watching some bad daily discussion TV show, where there's too much drama on everything. There must be better written books about business social media than this one. I always enjoy writing. Even though I wouldn't really feel like writing, when I start writing, it always makes me happy. That was the reason I wanted to read, what was said to be the best book about writing, Brenda Ueland's If You Want to Write. It would be easy to state that the book is old fashion and don't reflect todays writing. It was originally written already in 1938. The style of the book and some of the writing there are quite old fashion, but the idea itself is live and kicking. The main idea in the book is, that everyone is talented and have something to say. In the book Brenda tells in her unique way stories about what it is to really write from one's heart. That's the key message and carrying theme over the book, people will listen to you, if you really tell things from your inner self. That's a message I sincerely believe. Being open and not worrying too much about what others have to say makes your writing much better. The book and my experience tells that it is not easy. There's always the fear of shame and critisism that keeps us not telling things as we really think. I did like the book. It's not the best one I've read this year, but it's a good one. The message there is quite simple and there is only her words to take as proof. It's not a normal guide to something, but it's more of journey to be more honest to oneself. It's bit hard to recommend this book to certain people. 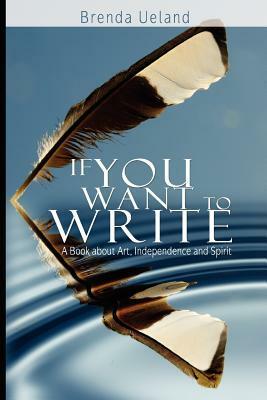 It's for those who already are a bit genuine enough to take over 75 year old book about writing to their hands.